This item is 7 years and 6 months old; some content may no longer be current. As of 1 October 2011, laboratories are reporting HbA1c results in millimoles per mole (mmol/mol) only. For the preceding two years, results have been reported in both percentages (%) and mmol/mol to allow time for both practitioners and patients to become familiar with the mmol/mol system. There may be concern that glycaemic control will deteriorate in some cases if patients or carers become confused due to the new reporting method. General practitioners are advised to explain to their patients that this is not a new method of testing, but an alternative way of reporting the same test results. Table 1 shows the equivalency of HbA1c mmol/mol and HbA1c %. Hicks J. Muller M. Panteghini M. Consensus statement on the worldwide standardisation of the HbA1c measurement. Diabetologia. 2007; 50:2042-3. New resources for primary care on the management of type 2 diabetes have been recently released by the New Zealand Guidelines Group (NZGG). In addition to the guidance document, the suite of resources produced by NZGG includes a primary care practitioner quick reference card, a presenter slide set to support CME and CNE, and a RNZCGP-accredited online CME unit. 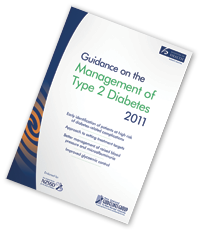 The content of these resources was developed by an Advisory Group, drawing on evidence from the Scottish Intercollegiate Guidelines Network (SIGN) Guideline 116: Management of Diabetes (2010). This article is 7 years and 6 months old. The use of antithrombotic medicines in general practice: a consensus statement Management of atrial fibrillation in general practice Transient ischaemic attack: shoot first ask questions later Medical management of stable angina pectoris Diabetes follow-up: what are the PHO Performance Programme indicators and how are they best achieved? Upfront: Infant mental health and child protection News in brief: HbA1c reporting and diabetes resources Correspondence: Warfarin or dabigatran for atrial fibrillation? Vildagliptin: a new treatment for type 2 diabetesA rising tide of type 2 diabetes in younger people: what can primary care do?Managing patients with type 2 diabetes: from lifestyle to insulinTestosterone use in older malesManaging patients with type 2 diabetes: from lifestyle to insulinResearch Update: Testosterone use and cardiovascular risk in older malesPrescribing testosterone in ageing males: why you shouldn’t read this articleAnnual Diabetes ReviewMonitoring diabetes before, during and after pregnancyIs point-of-care CRP testing useful in guiding antibiotic prescribing in patients with respiratory tract infections?